Sainsbury’s is my port of call this week, partly because of their launch of some house wines and also as most of their wines tend to exude quality. My first white wine selection was that of a Grande Réserve 2017 Bergerac Sauvignon Blanc Semillon, a wine not often seen in these parts. This aromatic, slightly off-dry white has lemony flavours with a touch of honeysuckle, a hint of nuttiness and is mellow with a flowery aftertaste – a good complement to fish and salmon in particular and seven readies will complete purchase thereof. Next, I turned my attention to two bargain Sauvignon Blancs, one from Chile and the other a house wine from the Western Cape of South Africa. A 2018 (yes, 2018) Chilean Phantom River Sauvignon Blanc proved to be fruity with citrus and tropical fruits to the fore, a hint of lime and an impressive minerality reminiscent of French terroirs – at just £5 my undoubted bargain of the week! The house Sauvignon Blanc from the Western Cape is even cheaper, at £4.80, sporting lemon, lime and grapefruit flavours, if a tad watery compared to the Chilean example, but still perfectly acceptable party wine! For £8.50 expended, the 2016 Taste the Difference Greco di Tufo had a summer meadow nose, fragrant aromas and mineral complexity that comes from the region’s volcanic soils along with an abundance of exotic fruit flavours – a wine that would pair well with grilled tuna. Four red wines then caught my eye with a £4.80 House Cabernet Sauvignon of Spanish provenance exuding blackcurrant, blueberry and vanilla flavours and proving to be eminently quaffable at this price, though lacking somewhat in complexity (as you might have expected!). For the loftier price of £8.50, a 2017 Santa Julia Reserve Malbec full-bodied red from the Uco Valley in Argentina and planted at elevations between 954 and 1,402m above sea level, a terroir that lends itself to concentration of aromas and flavours. Plum, spice and vanilla flavours abound and this smooth Malbec is cracking value. For an outlay of £10, the 2016 Antonin Rodet Red Burgundy proved to be a Pinot Noir for the last vestige of summer – light, fruity and medium-bodied with classic fruity tastes of strawberries, raspberries and red cherries. It is soft with a silky smooth finish and very drinkable! 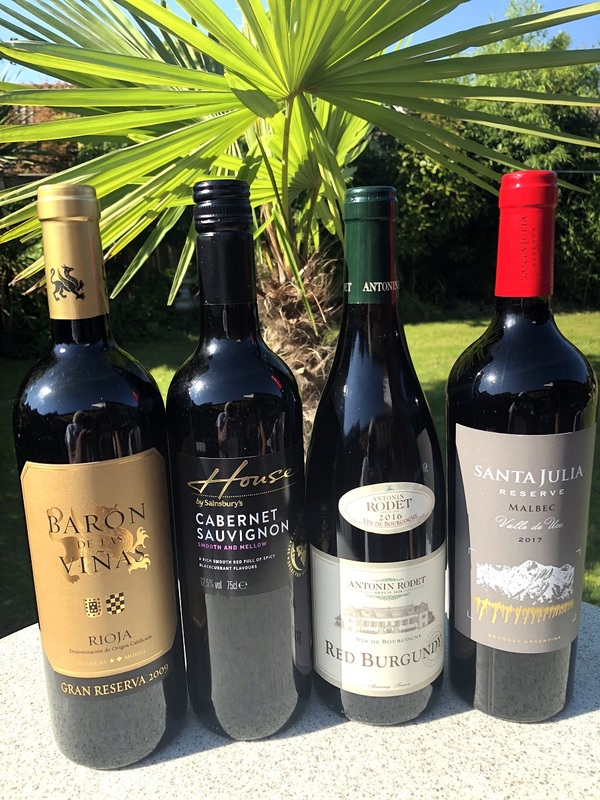 Equally on sale for £10 and my ultimate selection is a Gran Reserva 2009 Barón De Las Viñas Rioja which sports a lovely nose, has balanced acidity with a touch of spice, subtle pepper touches and hints of roasted coffee and ripe fruity oak with a hint of vanilla and a lingering finish – pure joy!